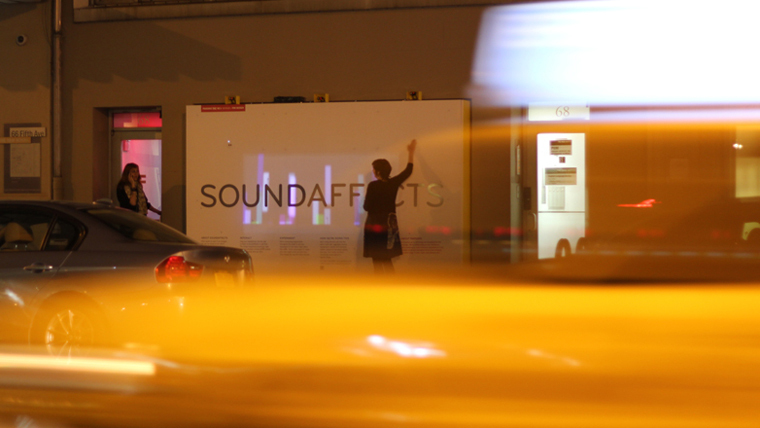 “A ten-day audio experiment that listened to more than just the audible noise of a New York City street corner, SoundAffects took the form of a wall on the corner of 5th Avenue and 13th Street that collected data input including temperature readings, color analysis of video feeds, precipitation measurements, noise levels, cellular phone activity/interference, and proximity sensors. 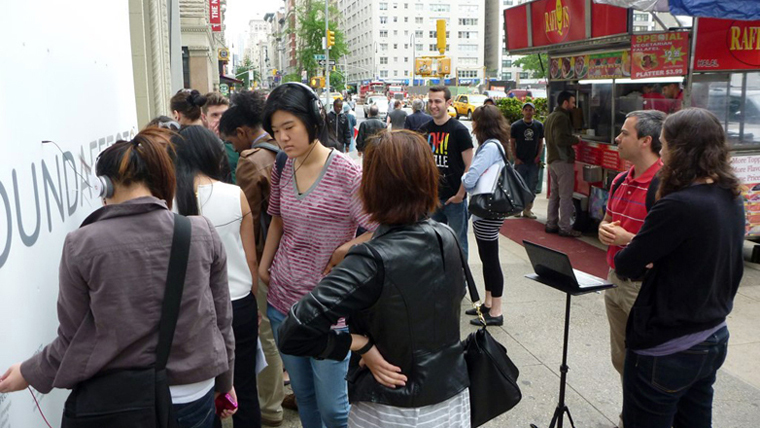 As the lead engineer, as well as the lead music composer on this project, I was always busy. Some days, I was stress-testing a cluster of Mac Minis that would eventually upload the piece to the internet in real time. Other days, I was tweaking synthesizers and arpeggios. My favorite part about this project was hearing it all in context after months of work. There was just something magical about how the music changed throughout the day–bustling, clicking , and chirping through mid-day, then careening through an eerie chromatic twilight modulation, until finally, in the middle of the night, it opened up into a low, slow, reverberant drone. And the chance occurrences were hilarious. I remember once I heard something funny and new in the music, so I looked over, and there was a bright red falafel truck jerkily rolling off the curb to head back to queens for the evening. I had programmed the colors in the street to vary the melody, but this falafel truck was taking red to a new level. 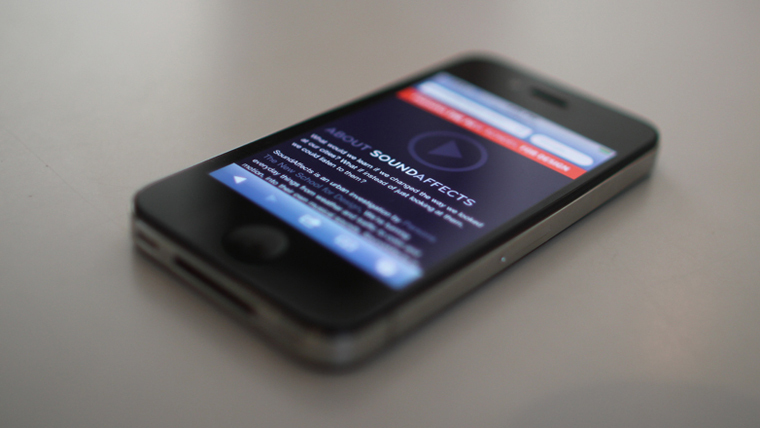 SoundAffects FInal Web from The New School on Vimeo. 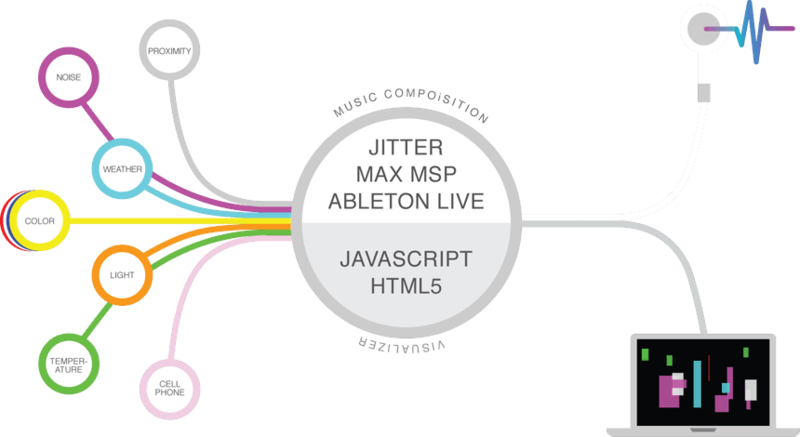 Graphic courtesy of mono, who were a joy to work with. People in the neighborhood could walk up and plug in to hear the music. 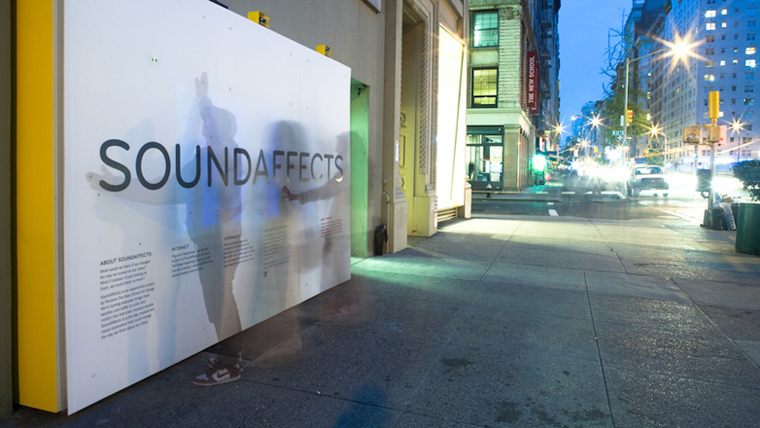 At night, there was a rear-projection that corresponded to the sound. Online, there was an ever expanding timeline that let us flag relevant events as they occurred. 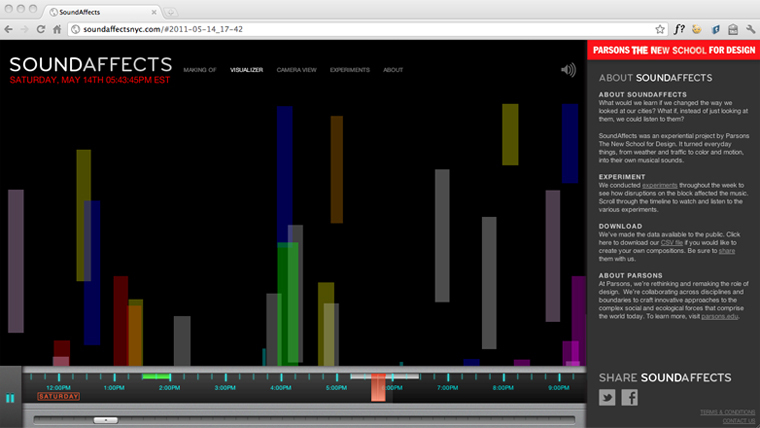 A visualization in HTML5 corresponded to the sensor data. It was also available on a special mobile site.